In recent times I had received the invitation to be a part of a vibrant program Penguin Books India invites you at the launch of “Conversations with Waheeda Rehman” with Nasreen Munni Kabir where I got the opportunity to interact and converse with the women known for her natural talent and haunting beauty none other than actress Waheeda Rehman. One of the first thing that came in my mind when I saw Waheeda Ji in the evening I remembered her toe tapping number so beautifully picturized on her “Rangeela Re Tere Rang Mein Yun Ranga Hai Mera Mann . . . Chhaliya Re Na Bujhe Hai Kisi Jal Se Yeh Jalan . . . Rangeela Re” from the 1970 release “Prem Pujari”. The song was shot in the exotic location of Switzerland in Hotel Grimsel Hospiz surrounded by mountain peaks just spectacular giving the aristocratic feel. Waheeda Ji is distinctly seen intoxicated, lost in dancing and shaking off her whole body in this lovely number at the party. Her moves provokes actor Dev Anand so much that he throws glass of wine as he could never believe her lover would drink and dance openly in the public. Produced, Directed and Written by Dev Anand for Navketan Films. Awesome lyrics by Neeraj coupled with melodious compositions by Late S.D. Burman and voice of none other than the “Melody Queen” Lata Mangeshkar. From the devastating loss of her parents when she was young to making a life in Cinema on her own terms the odyssey of Waheeda Rehman has indeed been a voyage of discovery. 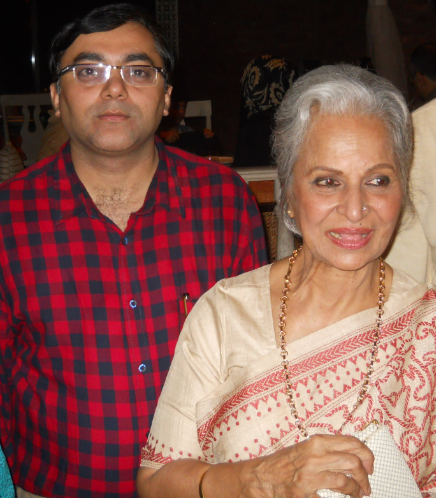 Even at the ripe age of 76 septuagenarian and Indian Cinema’s most beautiful women actress Waheeda Rehman is still seen to keep herself busy and occupied. Renowned for her natural talent and beauty, Waheeda Rehman’s career spans an astonishing array of key films in Indian cinema, including Pyaasa, Abhijan, Mujhe Jeene Do, Guide, Teesri Kasam and Rang De Basanti. Q: Had you not been an actress which other profession you would have chosen and why? A: (smiles) Had I not been an actress I wished to become a Doctor. While we were young, medicine was considered to be one of the most respectable profession for Women. I always wanted to work, and I even told my father I wished to become a doctor. I am still fascinated by medicine and the profession would have given me the opportunity to meet and treat people with all my love and faith. Now whether Waheeda Ji became an actress or Doctor is secondary but one thing Waheeda Ji was very sure off was that all the four sisters would do well in life. She even told her father: “Daddy, don’t worry, one day my photograph will appear in the papers. I don’t know why, but it will.” She had also told him I would own a farm and, many years later, she did. Rightly said, “Things do work when we listen to our inner voice” and Waheeda Ji’s voice of confidence was no exception. Nasreen Munni Kabir’s ‘Conversations with Waheeda Rehman’ abounds in anecdotes from the iconic life of one of Indian cinema’s most beautiful women actors. 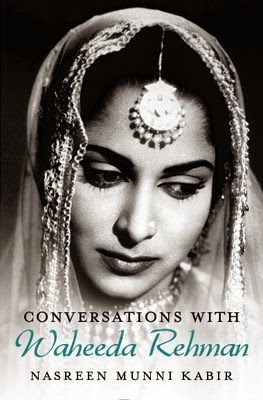 Penguin presents the evocative Conversations with Waheeda Rehman By Nasreen Munni Kabir.